A few days ago, I was traveling with a well-wisher of SVYM. During our conversation, she suddenly asked what Swami Vivekananda meant to me. Though I have deliberated on this question many times in the past, this was indeed the first time that someone asked me pointblank about it. How do I describe what he means to me? Should I talk about my first brush with him in the early 80s, or the continued journey of the last 28 years since then? Swami Vivekananda was a mere photograph that was hung on the wall of MES College in Bangalore where I studied between 1980 and 82. The caption below the photo read Swami Vivekananda – the Hindoo monk of India. I used to pass by the picture everyday without looking up or trying to find out what this person had done. I remembered reading about him in a lesson many years ago in school and that was that! I have already written about my later brush with Swami Vivekananda in 1982 and how I read much about him and by him within 3-4 months. From then on, I am on a continuous journey of discovering this extraordinary person and trying to understand his personality, though from the limitations of my interpretation of his works and my own personal experiences. One of the first things that stand out when I think of him is his extraordinary compassion and concern for the poor. Here was a man who would spend sleepless nights himself, worrying about how to help the millions of poor and down-trodden Indians whom he regarded as his ‘God’. Another dimension that attracted me to him was his Humanism. Man and his salvation is a theme that runs through all his works and he declared that he would not mind being born again and again to work for the salvation of man. Many freedom fighters of his time have claimed inspiration from his work and writings. Whether it was Subhas Chandra Bose or Gandhi or Rajagopalachari – all saw in him a very passionate Nationalist. Another extraordinary quality that I saw in him was his steadfast pursuit of truth. He never settled for half-truths or relative truths. And truth for him held meaning only when it was born out of direct experience. He was also a Leader extraordinaire. He sought no formal authority and had none, but had the whole country and beyond at his knees. He was inspirational in both his talks and writings, demanding the best out of everyone that he came across. Unforgiving with the mediocre and constantly exhorting each one to give his best, Swamiji could rouse all who came in contact with him – from the Maharajahs living in their palaces, to the common man on the street. One only needs to read the letters written by him to appreciate the inspiration that flows from them. The specialty of his leadership was his pragmatism and the constant focus on the larger picture – his vision of India occupying her rightful place in the League of Nations. He was the Manager’s manager. He built an Institution of the highest order, based on contextually relevant and pragmatic management principles. The processes that he laid down are followed even today not because he laid them down, but because they still serve the needs of the day. He was an eternal experimenter. He not only experimented during his entire life but also constantly goaded those around him to do so. He always maintained that he should not be blindly followed, but one should test out what he spoke and taught. His courage of conviction was legendary. Anecdotes of his early childhood show how he refused to be cowed down by the authority of his teacher. It was this quality that enabled him to set out to Chicago for the Parliament of Religions without enough money or even a letter of invitation in his pocket. What attracted me the most when I first read him was his brand of Socialism. His statements like half a loaf of bread was better than no bread at all; and he not believing in a God or religion that could not bring a piece of bread to the orphan’s mouth or wipe a widow’s tear, were enough to inspire a young 17-year-old in me. His constant attempts to elevate the status of women in Indian society and his desire to usher in equity, not by bringing down the rich but by pushing up the poor were indeed farsighted and socially relevant. These statements are the basis of much of my development thinking and practice. He was also an intellectual giant who could quote from the Vedas, the Bible and the Quran – all in one breath. He could speak on just about any subject – from Archaeology to Anthropology, from Science to Religion. There are legends on how he finished reading the entire Encyclopedia Britannica in a matter of days. All this I know is similar to the four blind men feeling the elephant and describing it to the rest of us. 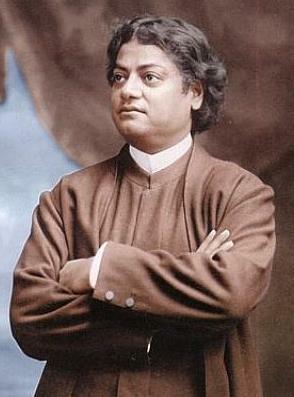 I am also aware that words and language are inadequate to describe the personality of someone like Swami Vivekananda. Every time I read him, I see him in a different light and there is always so much that seems new to me. He is so many things to so many people and I am sure that each one would have a different experience to narrate. But what is indisputable is the fact that he was one of our country’s proudest sons, someone who has never been more relevant for today’s India. Next Article Our flawed Social Security System!